ABC Chinese Restaurant is one of the few places in Albuquerque reputed to serve authentic Chinese food (Ming Dynasty has been serving traditional Chinese food for a while, but I hear that others have also opened). My initial visit to ABC with Gil Garduño, one of Albuquerque's premier dining critics and author of Gil's Thrilling Web Site, persuaded me that this restaurant is deserving of its reputation. We began the meal by ordering Ginger and Scallion Juke, a rice porridge flavored with ginger that is commonly served with dim sum (but almost never served in the "Americanized" Chinese restaurants). 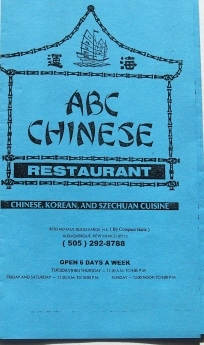 ABC has an "Americanized" menu with items such as chop suey and the po po platter. Although there are some interesting looking items on the menu, some of the more exciting Chinese dishes can be found on the blue menu, from which the juke was ordered. The juke, or porridge, was rather bland, but this is usually the case with plain juke before extra ingredients are added. I have gained enough experience with Cantonese food since my visit to ABC Chinese Restaurant to now prefer other types of porridge that are on the blue menu such as seafood, fish, black preserved egg with pork, roast duck, or beef. One of these will likely be my choice if I am able to make another visit to ABC. I will have to say that the choices for porridge and other items at ABC are quite impressive for those who like traditional Chinese food. For a main dish Gil and I opted for different versions of hot pots, also from the blue menu. My House Special Tofu Pot contained a brown sauce made with liberal amounts of garlic and ginger. The tofu was lightly fried and the medley of vegetables, including bok choy, had a flavor and texture of steamed vegetables. I was well satisfied with the quality of the hot pot dish, and the sample I tried from Gil's B-B-Q Pork with Oyster Pot was quite delicious as well. The hot Oolong Tea was high quality as well. It was actually a mixture of oolong, jasmine, and green tea that did not taste as sharp as regular oolong tea. The specialty of the restaurant is Cantonese cuisine, which includes the hot pots and various seafood dishes. Other types of dishes are served, including a Korean menu. Judging from my meal, I suspect everything served is high quality. In my opinion, though, when restaurants such as ABC offer an opportunity that comes close to an authentic Chinese experience it should be seized upon, especially in the Southwest where gloppy and gooey Americanized Chinese food predominates.